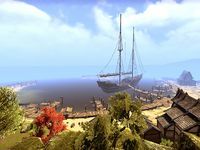 This article is about the city on Auridon. For the NPC, see Vulkhel Guard (NPC). 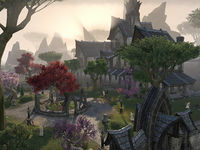 Vulkhel Guard is a port city at the southern tip of Auridon. It is ruled by Canonreeve Nesaranwe. 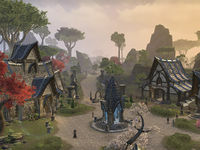 Vulkhel Guard contains all the necessary services for a large city, including crafting stations, a bank, and chapters of the Fighters Guild and Mages Guild. 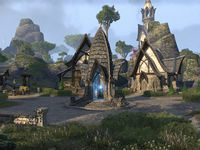 The Queen has planned a visit here as one stop on her tour around Auridon, and Watch Captain Astanya is working frantically to prepare. A skyshard is located on the middle balcony of the Manor & Treasury. Vulkhel Guard Objective: Support the City Watch in Vulkhel Guard. 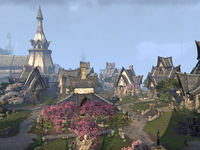 Vulkhel Guard Wayshrine is located just inside the northern entrance to the city, north of the docks and east of the manor. This wayshrine is unlocked as soon as you arrive on your alliance's starter island after escaping The Wailing Prison. † This person has been removed from the game. This page was last modified on 5 April 2019, at 12:54.